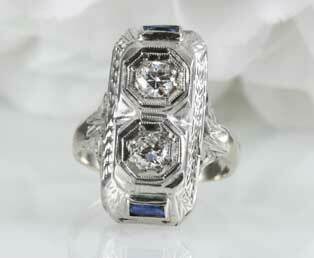 Two old European diamonds majestically shine in this 1920s Art Deco diamond sapphire dinner ring. A richly engraved open work filigree mounting is beautifully designed as the base for this Art Deco cocktail ring. Wheat designs are engraved along both sides of this dinner ring, while open swirls lay gracefully underneath. Two adjoining vertically aligned old European diamonds are framed within double octagonal borders with delicate millegrain accents. Two bezel mounted, rectangular shaped blue sapphires are found at both ends of this ring. This beautiful estate ring is crafted in 18kt (750) white gold. Old-European diamonds were mainly cut from 1900 to 1920. They are recognized by fewer facet cuts than today's brilliant cut diamond. They are admired for their romantic low light reflection.